Your electronic gadgets need clean direct current, or DC, power on which to operate. Disposable batteries produce DC, though they produce limited power. Alternating Current , or AC, adapters and battery chargers convert the reliable power from your household outlets into DC. Though they do similar things, differences exist between the two devices. Both battery chargers and AC adapters convert household alternating current to direct current. Inside these devices, a transformer reduces AC voltage from 110 volts to a lower value, such as 9 or 24 volts. A set of diodes called a bridge rectifier changes AC to DC, though at this point the DC has excessive electrical noise and unstable voltage. 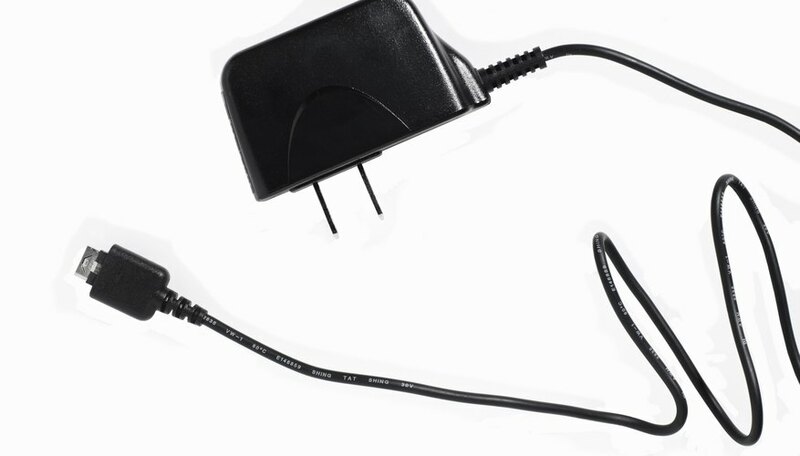 The AC adapter has filters and voltage regulators to stabilize the voltage and remove noise. The battery charger does not need filtering or regulation, so it may not have these features. A battery charger simply charges batteries. In addition to its AC to DC conversion circuit, it has a battery holder that accepts batteries for recharging. It may have an indicator, such as an LED or meter, that signals when the batteries are recharged. The AC adapter may charge batteries incidentally, though its main purpose is to power a device. Many devices, such as cellphones, have rechargeable batteries. When you plug the cellphone into its AC adapter, the adapter recharges the phone’s battery. As a battery charger may not have noise filtering or regulation, it is not suitable for powering devices. It has no electrical connector from which you might power a device; it has only the battery holder. The AC adapter, on the other hand, is designed to power devices. It provides clean DC voltage and has the requisite electrical connectors. An adapter for a laptop computer, for example, may power the computer even without its battery pack. Some AC adapters have a switch that lets you change the unit’s voltage, and an adaptable electrical connector that fits a variety of devices. These adapters are “universal” in the sense that they can power many different kinds of electronic gadgets. The adapters that come with a device, however, usually work only with that device. A battery charger is usually restricted to recharging batteries with a particular formulation, such as lithium-ion, nickel-metal hydride, or NiMH, or nickel-cadmium. They also handle a restricted range of battery sizes, such as AAA, C or D. Outside of those restrictions, however, the batteries will work in almost any device that accepts these standard sizes. 12vAdapters.com: How Do I Make Sure I am Ordering the Correct Power Supply Adapter for My Device?